Interstate 155 provides a cut off between the I-74 corridor at Peoria and the I-55 corridor north from Springfield. The linear freeway travels a rural route north from the Lincoln area to Morton, replacing the old alignment of Illinois 121. 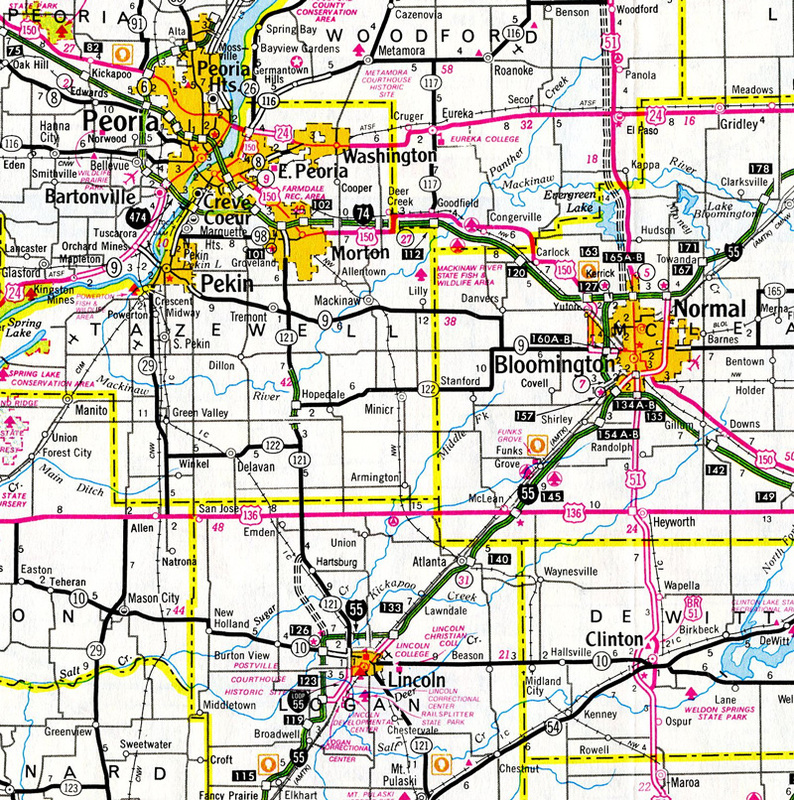 Illinois initially submitted the designation of Interstate 37 for the Illinois 121 corridor between Lincoln and Morton. AASHTO deferred on the designation at the Route Numbering Committee Meeting held on December 8, 1990, with the suggestion of a three-digit designation instead. The state resubmitted the route as Interstate 155 to AASHTO on June 9, 1991, and that designation was approved contingent upon the completion of the freeway route to Interstate standards. I-155 north elevates across a Toledo, Peoria & Western Railway line on the one mile approach to Interstate 74 in Morton. Photo taken 05/24/18. The northernmost half mile of Interstate 155 was reconstructed during the 2013-16 I-74 and I-155 Improvement Project. This included new signs, concrete pavement, and redesign of the trumpet interchange between the two routes. Photo taken 05/24/18. Interstate 155 north concludes at the ramp separation for I-74 east to Bloomington and Normal and I-74 west to Peoria and the Quad Cities. Photo taken 05/24/18. Ground level guide signs were posted ahead of the trumpet interchange joining Interstate 155 with I-74. These were removed during the I-74 and I-155 Improvement Project. Photo taken by Don Hargraves (09/23/02). Traffic merges onto I-74 west from the commercialized stretch of Morton Avenue just ahead of Exit 101 for Interstate 155 south. Photo taken 05/24/18. Interstate 155 runs through western reaches of Morton over the initial three mile stretch. The remainder of the 35 mile drive to Lincoln is rural. Photo taken 05/24/18. Interstate 74 spanned U.S. 150 and the River Trail of Illinois rail trail along the short stretch separating Morton Avenue (Exit 102) with the trumpet interchange for Interstate 155 south. This stretch was expanded to six lanes during 2013-16 road work. Photo taken 05/24/08. Interstate 74 previously crossed over the ramps for I-155. The freeway now travels at-grade with Exit 101 elevating above I-74 for the freeway south to Lincoln. Photo taken by Brian Dowd (12/01/02). One mile ahead of the southbound beginning of I-155 on Interstate 74 east by Cloverdale in East Peoria. Photo taken 05/24/18. The I-74 and I-155 Improvement Project expanded Interstate 74 to six overall lanes between I-474 at East Peoria and Exit 102 in the village of Morton. A fourth eastbound lane opens ahead of Exit 101 for I-155 south. Photo taken 05/24/18. Exit 101 parts ways with I-74 east for Interstate 155 south to Tremont, Hartsburg and Lincoln. Interstate 74 advances east through Morton to Bloomington. Photo taken 05/24/18. Pleasant Hill Road spanned Interstate 74 as the freeway led away from the merge with I-474 on the one mile approach to I-155 south (Exit 101). Diagrammatic signs for the upcoming split were removed during 2013-16 road work. Photo taken by Jeff Morrison (08/06/05). A second diagrammatic overhead outlined the trumpet interchange (Exit 101) with Interstate 155 south on I-74 east at the Muller Road overpass. Photo taken by Jeff Morrison (08/06/05). Interstate 74 previously crossed over the ramps for I-155. The freeway now travels at-grade with I-155 elevating above I-74 for the freeway south to Lincoln. Sign changes made here replaced Indianapolis with Bloomington for I-74 east. Photo taken by Jeff Morrison (08/06/05). Interstate 155 angles southeast from the crossing of Sugar Creek on a 5.2 mile exit less stretch leading to Exit 0 with Interstate 55. All signs for I-55 on I-155 south were replaced by 2013 to use Clearview Font. Photo taken 05/24/18. One mile ahead of the three-wye interchange (Exit 0) with Interstate 55 on I-155 south. Photo taken 05/24/18. Interstates 55 and 155 come together on the rural outskirts of Lincoln within West Lincoln township. Here I-55 turns east to overtake Historic U.S. 66 northeast to Bloomington, Normal and ultimately Chicago. Photo taken 05/24/18. Traffic partitions at Exits 0A/0B from I-155 south. Illinois 121 begins from Interstate 55 to the south of Kickapoo Creek at Exit 126 (Illinois 10). 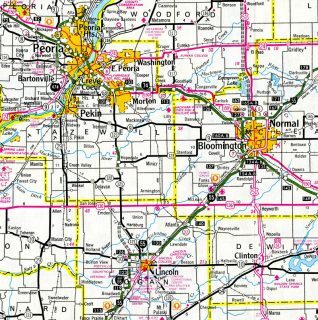 The 109 mile route travels southeast through Lincoln to Decatur and Mattoon. Photo taken 05/24/18. An end shield for Interstate 155 appears along the ramp (Exit 0A) connecting with I-55 south. St. Louis is a 126 mile drive to the southwest. A replacement of this assembly was located further south by the gore point of the ramp merge. Photo taken by Jeff Royston (11/25/01). Previous guide signs for Exit 0 on I-155 south. This is an uncommon instance where the terminus of an Interstate is signed as Exit 0. Other examples include the south end of I-65 and the west end of I-265 in Indiana. Photo taken by Jeff Royston (11/25/01). Interstate 55 leads due north from the split with Business Loop I-55 into Lincoln. The freeway next meets IL 10 and the north end of IL 121 (Exit 126), followed by the beginning of I-155 (Exit 127). Photo taken 05/24/18. Entering the folded diamond interchange (Exit 126) joining I-55 north with IL 10 west to Mason City and IL 10 & 121 east to Downtown Lincoln. Old Route 121 followed an alignment to the east from Lincoln to Hartsburg. I-155 overtakes the former IL 121 beyond Exit 6. Photo taken 05/24/18. Interstate 55 spans Kickapoo Creek to the immediate north of Illinois 10 & 121. The freeway then curves eastward through the three-wye interchange (Exit 127) with Interstate 155 north. Photo taken 05/24/18. A two-lane ramp (Exit 127) departs from the left side of I-155 north for Morton, Peoria and the Quad Cities as I-55 turns east for Bloomington, Normal and Chicago. Photo taken 05/24/18. Approaching the succeeding interchanges with IL 10/121 and I-155 on Interstate 55 north along the west side of Lincoln. These signs were replaced with Clearview font based panels by 2015. Photo taken by Brian Dowd (06/02). A ground level guide sign preceded the left-hand ramp (Exit 127) from Interstate 55 north for I-155. It was removed by 2013. Photo taken by Jeff Morrison (08/13/05). The initial guide sign for Interstate 155 (Exit 127) on I-55 south stands ahead of the Old Route 121 overpass in West Lincoln township. Photo taken 05/06/18. Continuing west along I-55 south between agricultural fields, drivers approach Exit 127 for I-155 leading north to Hartsburg. I-55 turns due south from the forthcoming exchange to complete the bypass of Lincoln en route to Springfield. Photo taken 05/06/18. Exit 127 separates from the Interstate 55 southbound mainline for I-155 leading back north to Peoria and Moline. I-55 overtakes old U.S. 66 again in six miles and reaches Springfield in 28 miles. Photo taken 05/06/18. One mile ahead of I-155 north on I-55 south. This sign was replaced by 2016. Photo taken 05/06/10. The previous overheads posted a half mile out from I-155 erroneously displayed Exit 127 instead of Exit 126 for IL 10/121. This was later corrected, with both overheads replaced by 2016. Photo taken by Brian Dowd (06/02). “31-MILE SUPERHIGHWAY OPENS AFTER 30-YEAR DRIVE FOR SAFER ROAD.” Journal Star (Peoria, IL), October 30, 1992. “Governor Quinn Announces $86 Million Capital Investment to Reconstruct I-74 and I-155 Interchange.” Office of the Governor – Patt Quinn, press release. March 28, 2013. “I-74/I-155 Ramps Reopening.” Office of the Governor – Bruce Rauner, press release. November 12, 2015.